Today I took a day off work to kickstart a few areas of the project. of the hairdryer that melts Baldwins) ivory was added for the windows and black for the underframes. 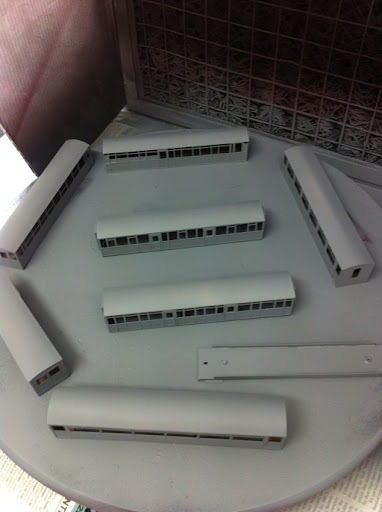 That means they are now ready for seats to be painted, people added and Han painting of roofs, ends etc. Harlech and criccieth castles had a few tidying up jobs completed and then too were primed. Brass was rolled for the roofs of 2043, 100 and 102 (plus 24 to come soon). This used the patented newspapers, mousemat and tube method. The situation with Locos was appraised and a priority list created. 87 is next for attention. The new green 143 was studied (especially the new bunker!). As was my part built kit for 109. Perhaps that should be built as a green 143 and my black 143 altered to 109 in time? In considering the one nearly complete power bogie for 109 (built by another, bought from eBay) 4 wheels were seen to be loose (caused by heat when soldering flycranks on I suspect). So the first job is to remove rods and the cranks to assess the wheels for either reuse with the new plastic bearings we have or to source new wheels. Finally we proved that the new motor bought for k1 is a far better match than the one previously installed in the front tank. The two motors are now much closer matched which should go a long way to explain the running problems. 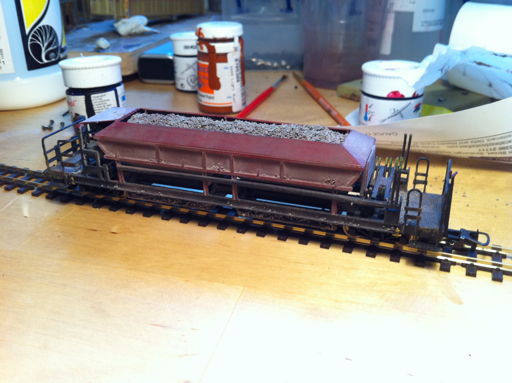 Tonight I added a lot more weathering to the Romanian ballast wagon. 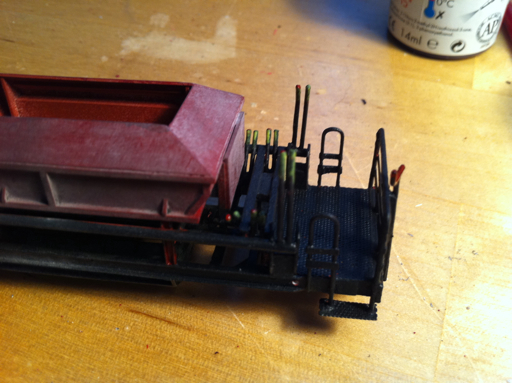 The ballast load was completed, a bit of extra lead weight added inside, general stray ballast added to the low level ballast doors and to crevices around the model, some rust highlights dry brushed on and the bogies reattached. Once final touching up is complete this needs a coat or two of matt primer. Earlier in the afternoon the new turnouts for the hidden sidings were pinned down into their correct positions and plain line track laid out to show the look of the eventual track plan - the shot below was taken standing on a chair above the board and even then I couldn't get the whole 6 foot board in shot! 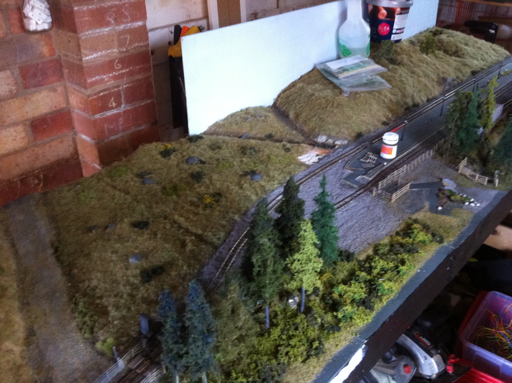 Various bushes have been added today plus the final batch of tidy up ballasting. 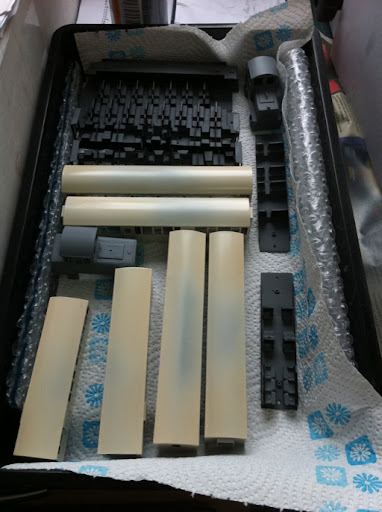 Painting the rails/sleepers with sleeper grime (railmatch) will be done tomorrow. Below is the culmination of many painting sessions (30 mins at once) with the Romanian ballast wagon made for me by Boston Largs Works (Rob Waller). It took so long as I didn't have time to devote more than 30 mins at a session and also because there are so many surfaces to paint! Also red really doesn't cover well so that took a few coats too. However I have enjoyed painting it as it is kind of therapeutic. 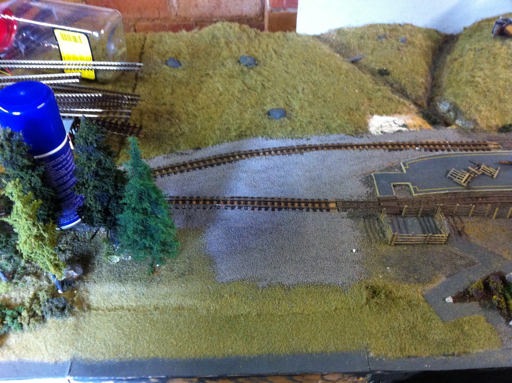 This is where I'm up to - body painted, initial weathering applied but with rusty lower level highlights to come. A simple plastikard insert to hold a ballast load is ready for its ballast to be glued on and the tie down cleats also need adding once the yellow paint on them is dry - holes are drilled ready. Then all it needs are some transfers! Bogies are done and wait for final varnishing before I reattach them. 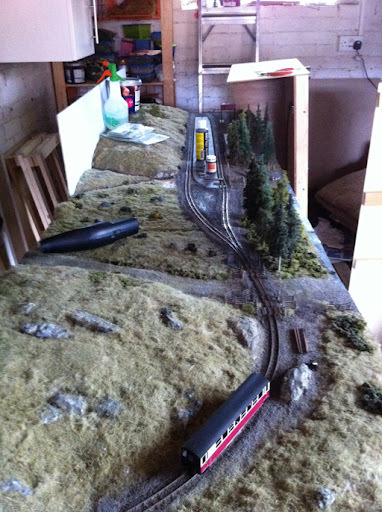 I expect tomorrow to be able to paint the track on the new extension piece after cleaning any stray ballast off the rail faces. 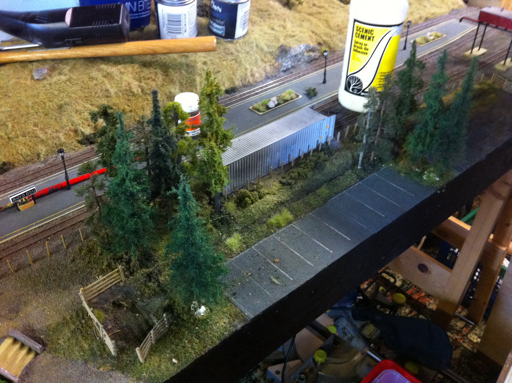 The ballast was dry, so stage two commenced - full depth ballast added around the track, and then using a dropper, woodland scenics scenic Cement was added to seal it in place. I have now rewired the extension (and as it happens found the source of the expong shorting on the way). 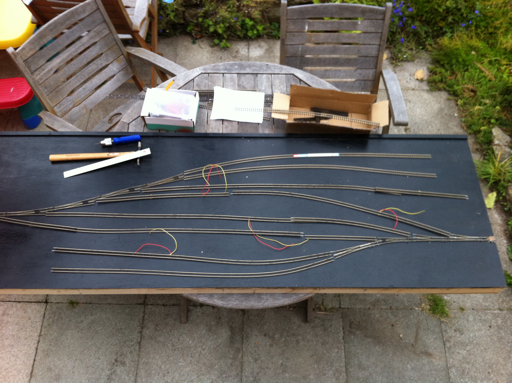 This means that tonight stage one ballasting (an initial drop onto pva glue) can commence. Alongside all this I purchased five gorgeous hand built Anita decor trees from international models. This have now also been placed and they look perfect. The key for me is to use as many different tree suppliers as possible to create extra realism. 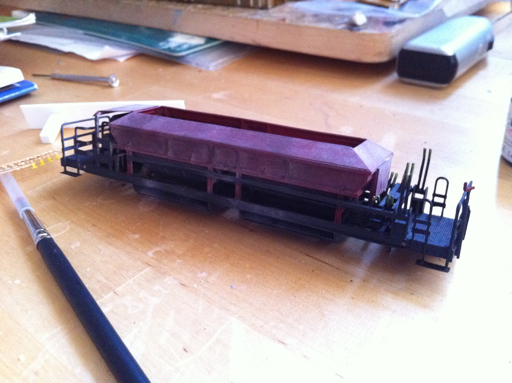 In other news the Romanian ballast wagon has had its steps and balcony meshes added, been primed in red oxide and now awaits painting plus the addition of the tiny tie down cleats which I have finally decided I will in the end add to the model.